Warning: This pool contain dihydrogen monoxide! I want to see a picture of the fountain and pool. If it connects directly to the pool, why can’t people get into it as well??? Actually, some pool chemicals are like the blue thing that you put in the toilet bowl. They’re meant to disperse slowly. They’re safe once they’ve dispersed in the pool but you wouldn’t want to handle them directly, which would include swimming in a small concentrated pool of them. In short: this sign holds water..
Long way to go for that joke, but I like it! If my penny quickly dissolves after I toss it into the fountain, will my wish still come true? 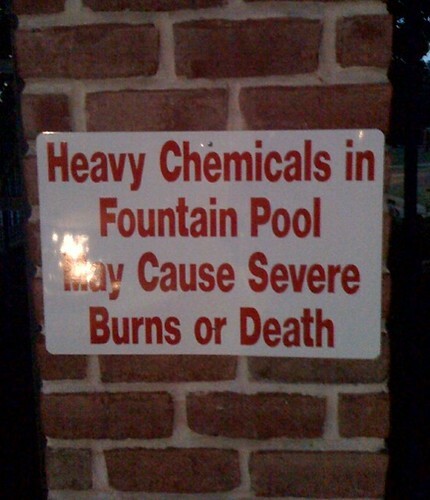 There are chemicals that are used in pools that are deadly, muratic (sp?) acid comes to mind. Actually that acid is not used in aactive pools, it is used after they are drained for cleaning prior to painting. If someone is usingthat in their pool they deserve to get burned and possibly worse. Clorine is far more deadly and can kill or used to make an explosive device. Muriatic acid IS used in swimming pools to help lower the PH. You are supposed to dilute it in a bucket of water before you add it to the pool and wait a few hours before someone swims in it. I think karen’s been drinking out of the fountain again…..
I’ve always wondered how the ghost ended up with such an extensive wardrobe. He was always dressed for the occassion, but all the other ghosts had to walk around in their bloody death clothes. Did his clothes turn to ghosts too? What’s up with that? He sees dead people, walking around like regular people. How was he to know this seeming regular person was also a ghost, when the ghost himself couldn’t even tell it wasn’t able to be seen by others. HOAs messin’ with err’body these days! This one I can actually get behind, a little. Bah. They should just fill the fountain with death machines, the way the Great Architect Kroagnon did with his pool. That’s the only way to be sure it stays clean. They could just take the fountain down, or put it on a raised platform that is unable to be climbed. Easy solutions. I think they should dye the water yellow and add one of those shark signs. Definition of ‘Heavy Chemicals’ : a chemical produced and handled in large lots (as a ton or more a day) and often in a more or less crude state —used esp. of acids (as sulfuric acid), alkalies, and salts (as aluminum sulfate). Yikes! What is going on in that fountain? Of course, aluminium sulfate is mainly used in the purification of drinking water, so I’m back to square one. What’s the point of having a fountain in the pool if you can’t play in it? I might not jump off one, but I’d be right there having fun in the fountain too. Honestly, some people need to get a stick-ectomy. 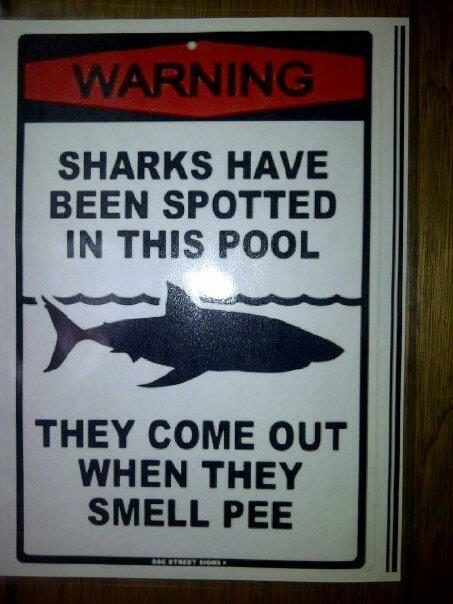 As a kid I would totally have peed in a cup, thrown it into the pool and waited anxiously for the sharks to arrive.